Ok, so it’s not gold, not silver, not even bronze. It’s a finishing medal, because I FINISHED A FREAKIN’ HALF MARATHON! In 2 hours and 27 minutes. I began with the 2:15 pace bunny, and for the first couple of kms I thought perhaps I was short changing myself by running with this pace group. It was easy! Running along with the pack, I was happy, my stride was good, my cardio was in check. 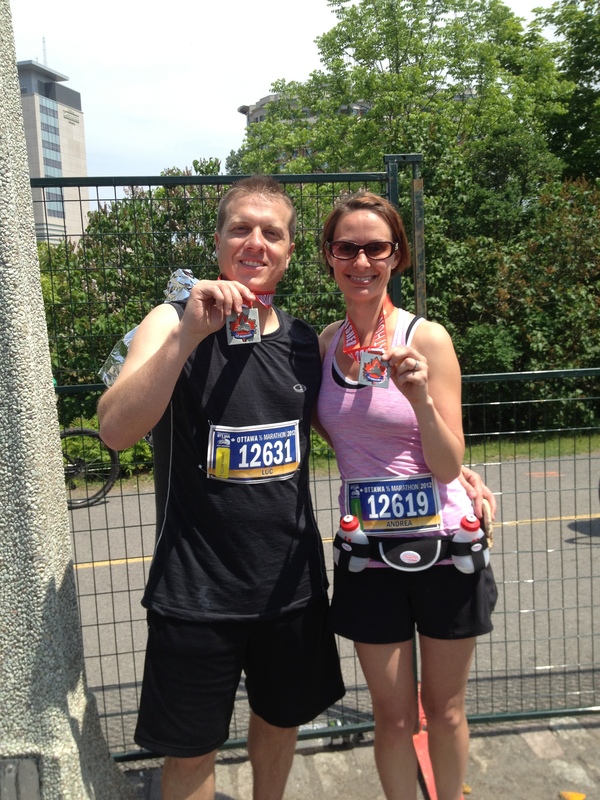 I was excited as I neared the 5 km mark – my parents were there cheering with my boys. I was excited to high five them and I received the nice boost of adrenaline I was looking for. Sometime after that point, everything became a lot more difficult. My legs felt heavy. Somehow the energy I enjoyed for those first five kms had drained out of my body. Having only completed a quarter of the race, it was time for the mind games to begin. I would not be giving up yet! As the race progressed, I had to adjust my goals. I made the conscious decision to slip back from my pace group – clearly that speed was not sustainable for me, at least not on that day. Around kilometre 8, something really weird started to happen. I started to shiver. I felt cold. I knew that this was not right. I’d ran at least 8 kms close to three times a week for the previous four months. This distance was not typically difficult for me. It was a warm day, and I was running in a race. I should not be shivering! In truth, these symptoms started to really freak me out. Maybe it was the adrenaline. Maybe it was the fact that I couldn’t sleep the night before (nerves!) Maybe it was the fact that I was fighting a sinus infection… I will never know. I just kept putting one foot in front of the other. Life’s kind of like that sometimes isn’t it? One small step over and over eventually led me to that blessed finish line. Familiar faces cheering in the crowd along with friendly strangers waving encouraging signs pushed me along. The last couple of kms were painful. I could see runners dashing to the finish line on the other side of the canal. It was so close yet it felt so, so far away. Leading up to the race I was certain that I would be a finish line crier. Scratch that – that’s not intense enough. I was fully prepared to be a finish line bawler. When my foot made contact with that finish line mat, I had a gentle welling of tears, but I didn’t have anything left in me for a full on cry. In training we were told not to “leave anything on the course” and no one can ever accuse me of breaking that rule. I proceeded down the chute, picking up my post race recovery snacks, before finally reaching the place where I would receive my medal. “Hi Andrea! How are you feeling?” asked the lady with the stack of medals. I bowed my head so that she could place the medal around my neck. Finally realizing that I had seen this goal through to completion, my body felt the relief and my mind felt the accomplishment. The tears flowed freely as I walked away. 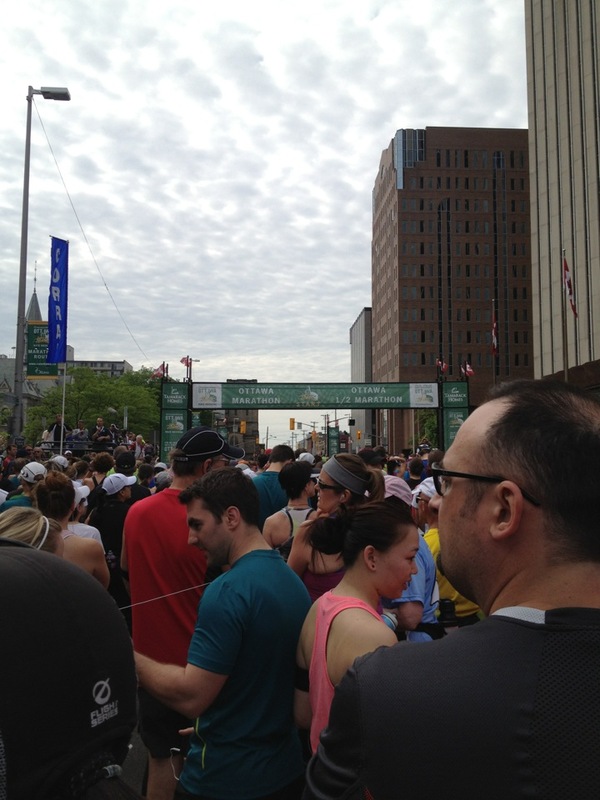 This entry was posted on June 24, 2012 at 7:08 pm and is filed under half marathon. You can follow any responses to this entry through the RSS 2.0 feed. You can leave a response, or trackback from your own site.